← Cooking with Champagne – you’re gonna love it! So… One of the classes I was most looking forward to taking when coming to Paris was a class on making French Macaron. They can be tricky to make so I wanted to learn all the secrets and tricks from the Professionals! Imagine my disappointment when I learned that the class being offered at Le Cordon Bleu was full. I wanted to cry! I’ve been on the waiting list for 4 weeks now but all the same I had to do something about it! Next, I found La Cuisine Paris! Their school is located in the Marais right near my friend’s apartment. They have a macaron class AND they had an opening!! What a BLAST I had in this class! It was taught in English only to my surprise, could be that only English-speaking students signed up. Our teacher, Chef Jenny, is an accomplished Pastry Chef who is American and did her training in Boston. She married a Frenchman and is now living in Paris. She has worked in many fabulous pastry shops here in Paris – including the famous Ladurée, known throughout Paris for the “best” macaron. She is such a good teacher, funny and personable, she had great stories for us, as well as fantastic tips and techniques. The other students in the class ranged from college students studying in Paris to tourists, as well as residents of Paris new and old. We all seemed to click together and the atmosphere in the class was just fantastic. We made two flavors; milk chocolate passion fruit and white chocolate raspberry. YUM! We worked in groups to prepare the ingredients. My group had the Milk Chocolate Passion Fruit filling so we set out to make it. As soon as the passion fruit puree started heating up, the room was filled with its delicious aroma and everyone started commenting on how good it smelled. We poured the boiling passion fruit mixture over the milk chocolate chunks to melt it and then added pieces of butter as we whisked it all into submission. Filling two pastry bags with our result, we tied them off and put them in the fridge to cool and set. We used the Italian meringue method to make our macaron, which means you pour boiling hot sugar syrup into egg whites that are mixing in the stand mixer. You could do this by hand as well but it’s a little challenging. The glossy whipped meringue is then folded into a paste made of ground almonds, powdered sugar, egg whites (unbeaten) and coloring. This is a tricky stage because if you over mix it and deflate the egg whites, the cookies will spread too much when you pipe them out so you have to be very patient. Piping out the cookies into perfectly shaped and even disks is another challenge. Once they are backed and cooled two of these pillowy cookies will sandwich a delicious filling so there has to be a perfect match for sandwiching. After some practice, we got it down. We even made some heart shaped cookies as Valentine’s Day is fast approaching. You’ll see in the pictures that we even combined the two different colored batters to make bull’s eye macaron. Baking the shells is the final tricky step. If you undercook them, they deflate and are so sticky that it’s impossible to get off the parchment paper. If you over bake them, they crack and fall apart. Thankfully with our expert Chef’s guidance, our shells came out perfectly and the last step of letting them cool to fill them was under way. 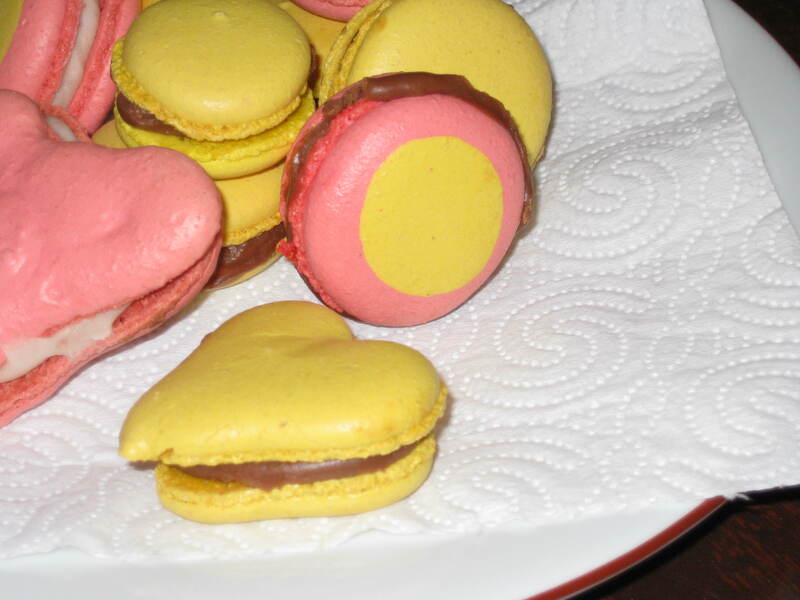 French Macaron are a bit tricky to make but the results are heavenly and worth the effort. Now one of the biggest secrets of French Macaron making is that you shouldn’t eat them right away. They should be refrigerated for at lease 24 hours to develop their flavor and texture. You can eat them right away but they will be dry and not as delicious. My 24 hours is almost up and I can’t wait to dive into them tonight!! So even though I was disappointed in not being able to take the class at Le Cordon Bleu, it still all worked out in the end. I had a fantastic learning experience, some awesome macaron to take home with me, I made some new friends, and I had an experience at a different cooking school here in Paris – ce magnifique! How exciting, looking forward to my next trip to France and taking a course or two. I took a class at La Cuisine and really enjoyed it. The owners are just the nicest people. Great post!